The project was a collaboration between 4 Lewes makers, Anne Marie ‘O Sullivan, Jonathan Swan, Mike Pattison & Tom McWalter as part of Make Lewes Festival 2015. 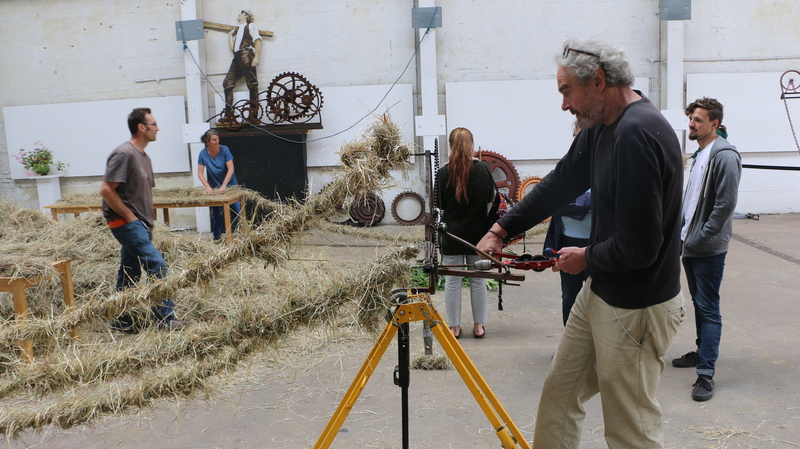 Using an age old technique, a simple cranking tool called a wimble was used to draw and twist a hay rope from the bale. When 3 long single ply ropes were made they were attached to Mike Pattison’s amazing rope making machine and lovingly twisted to form a dense 3 ply rope. Tugs of war, weight and strength tests all revealed that the rope was mightily strong. All in the name of fun, the team decided a rope bridge was required to span the beautiful Foundry Gallery in Lewes. Teams set to work on production. 40 hands tying knots, 6 hands cranking, 8 hands feeding hay to the rope-makers, 6 hands laying the hay out, a mere 2 hands on quality control (Tom McWalter). 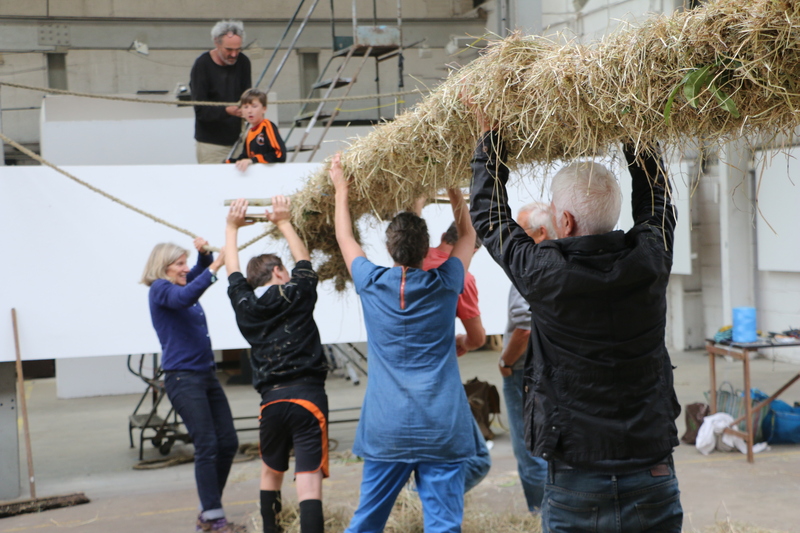 Hard work, conversations, cogs, cake, excited participants, delighted makers and by 4pm on Sunday the rope bridge was erected (thanks to Jonathan Swan up a ladder). The lightest and smallest participants were selected to try the bridge first. Felix (age 2) made a fine dash across it, followed by Arlo (age11). 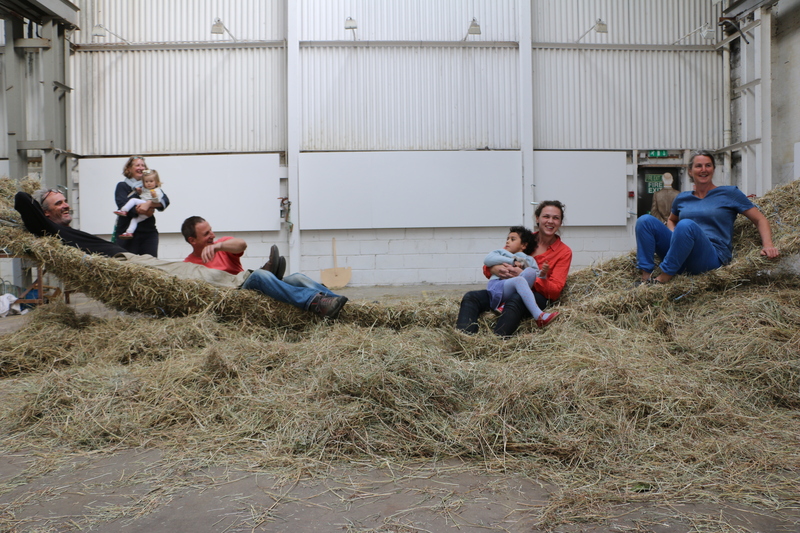 They was followed by several keen volunteers and finally by 4 makers who lounged on it while small children rolled in the remnants of the bale. A great day of making for Lewes.